Something so ordinary as a shoebox can accomplish the eternal when it is packed with toys, school supplies, hygiene items, and God’s love. Powered by prayers, it can help lead children and families to faith in Christ, inspire pastors, plant and grow churches, and encourage disciples in some of the most unreached places in the world. It all starts when people decide to bless a child overseas through Operation Christmas Child, a Samaritan’s Purse project designed to deliver good news and great joy to boys and girls around the world. Individuals and families decide whether they will pack a shoebox for a boy or a girl and then look for gifts appropriate for a specific age range. Prayerful shoppers search for items to delight a child: a toy car or a jump rope, a slinky or a doll. They look for practical things like pencils and paper, and necessary items such as soap and a washcloth. Whether toys, school supplies, or hygiene items, the giver seeks to pack their shoebox with as much fun and blessing as it will hold. Before closing the lid, the giver can include a note for the recipient, often complete with a photograph. The person who packed the gift then pauses to ask God to deliver the shoebox to just the right child—the child for whom the things inside would be especially meaningful or even be an answer to prayer. After being taken to local drop-off sites this week, the shoeboxes are then delivered to regional processing centers where volunteers prepare them for their trip overseas. Hundreds or thousands of miles later, the boxes clear customs, entering the care of Samaritan’s Purse ministry partners who plan distribution events at churches and other locations. These distributions often begin with music or puppets and include a presentation of the Gospel that a child can understand. Then the big moment comes. Each child receives a shoebox and after a countdown, they all open their gifts at the same time. Squeals of delight and shouts of joy fill the meeting area. What goes into a box is fun, but what comes out is eternal. 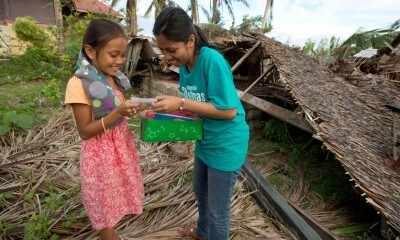 A gift of love in the form of a shoebox softens hearts and prepares them for the Good News of Jesus Christ. Children trust Christ for the first time, inviting Him to be their Savior. This changes families, neighborhoods and entire communities. One shoebox can also restore hope that there is a God who loves, cares, and is concerned about the details of a child’s life. And when you bless a child, you minister to parents as well. Through shoeboxes, churches grow, disciples multiply, and doors open for the Gospel—sometimes even in countries where it is illegal to be a Christian. What begins in the heart of someone who cares can change eternity for a child and a family. The process happens millions of times over. 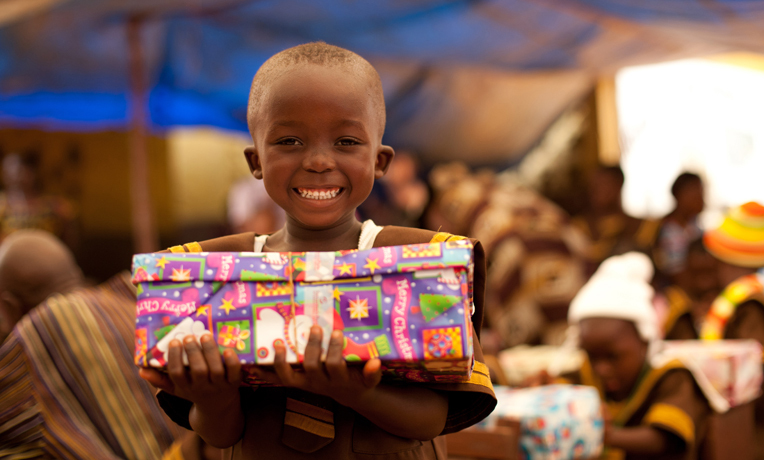 Since 1993, Operation Christmas Child has delivered more than 113 million shoeboxes in over 150 countries. Many who receive boxes are also invited to attend a 12-week follow-up discipleship program, The Greatest Journey. Here they learn more about what it means to follow Jesus and walk with Him for a lifetime, and how to share their faith. Receiving a New Testament at graduation, they are equipped to grow and bear fruit for Christ’s Kingdom. 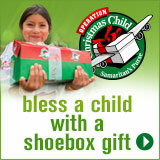 You can be a part of this amazing program by packing a shoebox full of fun items for a child. Please join people across the country who will be packing millions of shoeboxes and delivering them to the nearest drop-off location this week.